It's bloody gorgeous...there see...gender neutral. bruceb1959 and B.I.B. like this. Chinese language does not give gender to objects. I personally think called computers female or tables male a stupid practice. So it is equally correct to say ship is handsome or beautiful. N00813, Neutral Zone, Intrepid and 2 others like this. AeroEngineer, N00813, 2handedswordsman and 5 others like this. The Wikipedia article claims the propulsion is derived from the obsolete Soviet 80's era steam turbine design. Do we have any additional details on the powerplant? Do we have any additional details on the powerplant? Yes we have. At various points deep in this forum. But you have to look for yourself. It is simple and it is multi-fuel. Given that the design was to have as little modifications as possible why not just keep the steam turbines? So they did. Steam boilers were used for decades, including in the Kitty Hawk class which preceded the Nimitz. It would be rather much simpler to convert such a system to a steam catapult design than other conventional propulsion systems. Steam catapults were the original proposal for the Type 002 carriers. I could see a change on the EMALS equipped carriers but for this one I think it made sense to keep the same propulsion type. I was wondering whether they innovated on the original design. Something on the lines of combined cycle gas-steam would be interesting but unlikely, given that it would be a major redesign with main chunk of power derived from gas turbines. Steam catapult upgrade theory does support steam turbine choice, but I doubt that was a major consideration. On the downside, steam turbines together with boilers and condensers take up more space compared to contemporary designs if you're going STOBAR. I was wondering whether they innovated on the original design. When installed in exactly the same strength and quality as the original designers intended, they have a better propulsion system in 002 (2nd Liaoning) than the Kuznetsov. Quite likely the IEPS systems were not ready on time and like I said they originally thought the CATOBAR carriers would use steam catapults. The change in the design to EMALS on Type 002 was made really late in the design period. 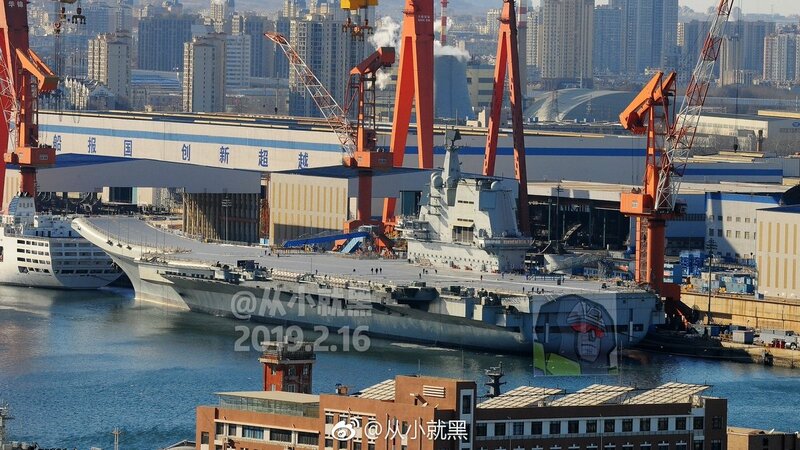 Way after the Type 001A began actual construction. It took some major convincing. So hindsight is 20/20. Yes IEPS would be nicer considering how, say, the QE-class is designed, and that they did go for EMALS in the end. But this was not possible to know nor were the components for IEPS readily available at the time. I think. Just consider all the components you would need. Higher power gas turbines than the ones used on the Type 055, electric power generators (only recently did news of a 20MW converter become available according to news reports), and electric engines. I think it is quite likely if they do go for a system like that they will test the IEPS components on a smaller vessel first. Rather than on the carrier. At least that is how I would do it. Think of how the Type 45 destroyer preceded the QE-class in British service.